I have spent the last month on yet another nYNAB trial, which has ended in...well, abject disaster, frankly. I gave up on the entire credit card debacle, because absolutely nothing that anyone tried to explain to me, and no amount of futzing and fidgeting with how they work now, made them work in a way that makes sense to me. But other than that, I thought things were going...ok? OK-ish, at any rate. Until February 1st. When - without doing ANYTHING other than logging in - my TBB number is suddenly MASSIVELY NEGATIVE. Like, $4k negative. The last time I logged in - 1/31, before I left town for the weekend - the TBB was positive for January. It matched, very exactly, the cash remaining in my cash accounts. All was good. February: $0 budgeted. MASSIVE negative TBB. Ok, I figured it was just that I needed to catch up and budget money I'd spend over the weekend. Essentially, budget what was leftover from January, right? Except - WHERE DID MY MONEY GO? WHY did the TBB suddenly go from a good number to a bad number? And now I scroll back to previous months, all of which had $0 TBB, all of which had "Budgeted" equal to "Activity" with "Total Available" as $0, and about half of them going back a year or more are now WRONG. Like, thousands of dollars (and random change) wrong, all over the place. I DID NOTHING. It was right, I left town, I came home, I logged in, and FUBAR EVERYWHERE. Conveniently, on the last day of the free trial. NOT a good way to convince me to plunk down any of the ACTUAL available money I have. I guess I'll take nYNAB's word for it that I have no money available and not spend any, at least not for a nYNAB subscription. I'm off to download .qfx files to import into YNAB 4, which will hopefully limp along long enough for me to figure out where to turn next. Did you end January with ANY of your categories negative? If a category ends the month negative, then it zeros out the following month, and the TBB will be negative, because you had spent more money than you actually had. Good luck! For the credit cards, maybe you've already tried thinking of it like this and it won't help, but how I think of it is the amount available (green) for a credit card is how much I have on hand to pay it off. So if I'm paying in full, the available will match my credit card balance exactly. However, if I'm only planning on paying say the minimum, then the available should be $35 or whatever. After you set it up that way, it will take care of itself, and you will always have enough for that initial payment PLUS whatever you've charged on it since then (since YNAB automatically sets aside enough for you to pay for your purchases). It's just the initial setup that can be tricky. Aritavashkai Nope. Everything in January is either gray ($0 available) or green. Aritavashkai I understand (academically) how credit cards (are supposed to) work. It just doesn't map logically in my head on an ongoing basis. In other words, I GET it, I just HATE it. It feels...excessively hand-holding and frankly overbearing and condescending. If I *want* to transfer money from my category to a mythical "don't forget to pay your bills!" category, then I'll do it myself, thankyouverymuch. Melissa Lol! That makes sense. I love it personally because it's just "set and forget", but I can see your point. That's frustrating if everything in Jan was positive... I agree with Ben. When I have run into problems, YNAB help has been great. Once I totally messed something up and couldn't figure it out even after back and forth with them, and they actually made me a video showing me what was up! Melissa Ah. Just saw your reply to Ben about the help. Hope you can figure things out! When something totally whacky like that happens, before freaking out, try logging out completely, shutting the browser and then going back in. I've seen numerous people have crazy things like that happen and then say it resolved after logging out and logging back in. That said, I'm still using YNAB 4. Support has been great for me, I'm at about 20 interactions with them. Ben K. My issue is that every time I talk to them they want direct access to my budget, which...no. Just no. Frankly, if their system is FUBAR enough that doing math won't solve the issue, then I can't trust the system. Period. Melissa Hey Melissa. I totally get why you wouldn't want other to see your budget... I am with you but I got to be honest. I thought they system was pretty crappy with some issues I had, and with Remote Help, they were able to tell me where I was wrong. And well, it was me all along. You should consider enable support access. Its not like if they can do anything with you money...and trust me they couldn't care less about the amounts there. They just want to help. Hopefully you will figure it out. I had tons of issues at first handling my CC, my line of credit and my multiple chequing accounts but got the hang of it. Without any fresh start yet (I started a month ago). Melissa I just don't buy this at all. I also work in a high security field. Either you want support or you don't. You should know as well as anyone else that the vendor asking for access is just a formality. If they want access to a product that they host and provide for you, they can get it without asking or you even knowing. Melissa you could see if'd accept a psr file. It's a Windows tool to record your screens and clicks, then send them as a single file. For windows, just type psr in the search box. Ben K. I'm actually working on a fake budget now to see if I actually do understand the process, since it's cleaner than the years of imported transactions. (And I've found that either I don't understand something or there's a bug, but I'm not yet sure which it is.) Once I figure it out on a fake budget I'll see if I can figure out the real budget, and go from there. Melissa sounds good. I found a 3 month trial, not just the 34 days. I certainly didn't understand enough by day 34. Ben K. This was my third or fourth go-round with the trial. I actually paid yesterday, in the hope that having skin in the game will make me stick with it. If not, I'll cancel. I mean, we all would probably love to help you make it work, because given your descriptions of the problems, there’s also potentially something wrong with hiw you’re using version 4. But I get the impression that you just want to be heard. So, I do hear you. I understand that you are frustrated. If you don’t want any help, “I hear you” is all I can provide. You can export your web app data as a CSV to keep the transactions. WordTenor I didn't say I wouldn't like help (although I can see why it seems I don't, and honestly I'm so frustrated at this point that I am probably conflicted on the topic). Frankly, the best budget system I ever had was a steno pad that I flipped to a new page every Friday when I got paid. I'd write how much I got paid at the top of the page (usually the vast sum of about $250) and list what had to be paid before the next Friday (Gas: $9. Phone: $13. Car: $100. SAVE FOR RENT: $75) and then the number at the bottom that was what I could spend on the category of "everything else" (THIS WEEK: $53). Usually with a BIG SHARPIE CIRCLE around it. So the "fundamentals" of YNAB are very familiar to me, because that's what I effectively did except I budgeted for the future as well (the equivalent of "goals" today, I guess). I guess what bugs me (for lack of a better term) is that I have spent hours and hours on these forums and elsewhere, seeing people frustrated to tears with the same set of issues - consistently, over and over, with EXACTLY the same things. And the "official" answer is "YNAB knows best, you'll figure it out some day. Take a webinar and watch a video." Which I find patronizing and not useful. If your system is so confusing that THAT many users don't get it, you need to re-think whether that system is All That. Melissa YNAB can probably be simple as your Steno pad, if you let it. Or close to. I love explaining YNAB to people, and I would love to help you with it. Don't get me wrong here. I think everybody here that bothers to stick around want to help people until they see the penny drop. Most of us agree with you that a) the videos are not always useful and b) even if they are, many people need to learn by seeing the issue explained as it is relevant to their own personal budget. That's okay! There's nothing wrong with that. On the previous thread you started about your credit card, you disappeared before we could help you through the root of the problem, which is this overspending/float that you've now identified. I hear you that you are frustrated (I mean that sincerely) and I'm sure it seems like eventually the best course of action is to throw up your hands and leave. But I'm watching you keep getting very close to understanding where the issue is and then being so frustrated you quit. If you want to quit, you can quit. We, your fellow YNABers really have heard you and sympathize with your frustration, even if the company doesn't. But if you don't quit, we can probably get you there if you'll let us. WordTenor agree 100%. I'd like to add the more important thing than YNAB or XYZ, is to know where your money is going and make better decisions. My credit union offers a free online tool or members that is very close to a steno pad, but it's better than not keeping track at all. WordTenor I totally hear you and appreciate what you're saying, and also the offer of help. I think part of my problem is that I may trying to solve too many problems at once - I'm trying to understand where I am now, so that I can move forward with confidence, but I'm also trying to understand the underlying issues. For me, that includes years worth of history where things have possibly (likely) caused problems in the past even if it doesn't represent where I am today. So while I'm paying for what I buy today with today's (or last month's) money, there's history where that wasn't the case. Today, for example, I was looking at a few months where I bought things on a CC with budgeted money, but then ALSO bought things that were NOT budgeted, and the mix of budgeted and non-budgeted money and how that made payments add up (or not) and what messages mean what where (leftover money from last month? add the planned payment PLUS the difference between the planned payment and the budgeted purchases? Or...something?) had me spinning in circles until I (again) had to walk away because the other option was getting dangerously close to tossing my laptop across the room. Where "Funds for [month]" is equal to income for that month plus the "rollover" from the previous month (the ending TBB from July, in this case). In the right sidebar, there's a "Total Available" that matches whatever is tagged in the Credit Card Payments category. I think that's all...right and correct. Except that what I now think has happened is that, over time, the credit card payments issue has played havoc with my entire budget in a way that has compounded over years. So...I am now *guessing* that how YNAB is handling credit cards is the entire sum of my problem from day one, it's just somehow compounding it month over month and somewhere back in history things went off the rails, but...honestly, it's a great big mystery to me. Where did that $3.82 come from? Eventually it was gone, but there's some math happening somewhere that I just flat out do not understand in that credit card bucket. Likely related to payments made on debt I carried for awhile back, but...honestly, I Have No Idea. And that brings us to February 2019 where I have $2600 in my checking account, nothing budgeted in February except to offset money already spent ($0 available in all categories), but a NEGATIVE TBB of about $3600. Looking at it more deeply, it looks like it's entirely carryover from credit card...stuff...from long ago, because when I expand that category group (which I never do) it's got THE MOST RANDOM ASSORTMENT of numbers in there going way, way back. I'm guessing when I started the trial last month and imported from YNAB 4, someone gave me advice to somehow...zero something...somewhere...in the credit card area, and that worked for January but has UN-worked now, and...well. 1. Is my guess correct that it's this credit card nonsense creating this issue? My best guess is that it's because YNAB shifted money from the category where the expense lived (e.g., travel) to the credit card payment, but if I did not actually pay that amount right away and carried it as debt, the budget immediately gets thrown into disarray when I do pay it because now the budgeted expense (e.g., travel) was in one month but the payment transfer was in another month(s)? Or...something? 2. If yes, then how do I actually correct it FROM HERE going forward, assuming I don't want to go back and re-do my budget for 8+ years of history but do not want to lose the transaction history? 3. If #1 is correct, then how would I effectively manage something that I DO NOT intend to pay off immediately? For example, I bought a refrigerator that was $2500 using a Visa card. The terms of the purchase were 12 months same as cash, so I decided to do that rather than tying up $2500 now. So on the Visa account, I show a purchase of $2500 categorized to "Home Improvement". If I budget $2500 NOW to that category, it assumes that I have $2500 in liquid funds (cash) and removes that from my TBB, but that is not what I want. I want to BUDGET $300 today and then $200 each month for the next 11 months so that it's paid off a month ahead of the 12-month deadline. 3b. Yes, I know that it's not "YNAB Kosher" or whatever, since I'm theoretically spending cash I don't have, but even if I DO have the cash I'd rather let it sit in my account and earn interest for 11 months rather than pay it in full now, so what I want to know is how to do it in a way that makes it irrelevant whether I have the funds now or not (aside from the initial $300). I want to show the purchase in the correct category and then shift funds from my cash account to the account where that debt will live until I decide to pay it off. I *think* that this (conceptually, at least) is where things have gone off the rails entirely for me with nYNAB. how would I effectively manage something that I DO NOT intend to pay off immediately? For example, I bought a refrigerator that was $2500 using a Visa card. The terms of the purchase were 12 months same as cash, so I decided to do that rather than tying up $2500 now. So on the Visa account, I show a purchase of $2500 categorized to "Home Improvement". If I budget $2500 NOW to that category, it assumes that I have $2500 in liquid funds (cash) and removes that from my TBB, but that is not what I want. I want to BUDGET $300 today and then $200 each month for the next 11 months so that it's paid off a month ahead of the 12-month deadline. I can tell you exactly how to do this part. Do NOT budget $2500 to your Home Improvement category. It will be overspent. That is reality. You have to accept that. The amount your home improvement category was overbudget is converted to new debt on your credit card when the month rolls over. The home improvement category will be zeroed out when the month rolls over. Directly to the payment category for the credit card you used, add $300 to the budgeted column. That is money you are setting aside for the express purpose of paying off unbudgeted purchases, whether they were unbudgeted because they were pre-YNAB debt or because you made a purchase that you couldn't cover with your budget in YNAB. Next month, allocate $200 directly to the budgeted column. Continue doing that every month until you've paid it off. bevocat I think I get what you're saying, but when do I BUDGET the home improvement funding? Only the first $300 that I'm paying in cash now? And let the rest allocate to the credit card debt until it's paid off? Melissa Yes, that is exactly how you would handle it. In February you would budget $300 to home improvement and then spend $2500 on the CC and categorize it to home improvement. This will show the Home Improvement category as overspent with a yellow -$2200 in it. The CC balance should show -$2500 (assuming no other spending on this card) and the payment available for the CC on your budget screen will have $300 in it. This means you can make a $300 payment at anytime without affecting the rest of your budget. When you move to March, the overspend in the Home improvement will go away. The category available will be at $0. 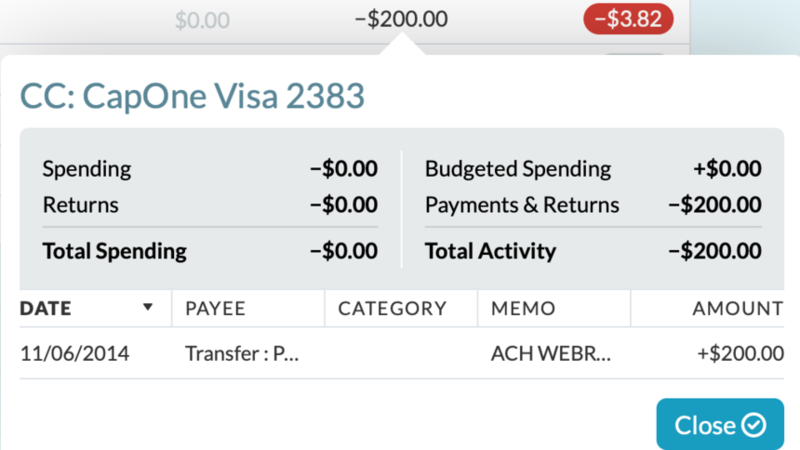 If you already made your CC payment in February, the card balance will be -$2200 and the payment available will be $0. If you haven't made your payment, the card balance in the account screen will still show -$2500 and the payment available to the credit card on the budget screen will have $300 available. Moving forward as you get income and inflow it to TBB, you will budget directly to the CC category in the budget screen. This will reserve the money for payment and you can make that payment when it is due and watch the balance go down. You can even set a goal to pay by target date and YNAB will do the math and remind you how much you should budget to the CC directly each month to meet your goal. Melissa You budget for things before you spend the money. If you were in a situation where you had to spend the money before you budgeted for the full cost, then you now have debt. So moving forward you budget to pay off the debt by allocating to the credit card payment category. chahan Thanks - so I would budget the $200 in the 'credit card payment', which turns the 'available' into a green $200 until I pay it. And I can set the goal at 11 months out (to get the $200/month) with the 12th month buffer. It doesn't matter (ultimately) where I budget the money (which category) since the reports at the end of the year will be for spending, and the budget will show that I did the extended payments on credit. That makes sense for that use case - thank you! jenmas Got it. Sometimes that's a rationalized decision (e.g., 12 months no interest when I can hold the cash earning more money) and sometimes it's because you can't afford it and go into debt for something immediately, but either way once it's out of this month you're paying against debt, not the original category. That makes sense. Melissa If you don't have the money, you are just acknowledging that you have created debt and all future budgeting would be directly to the the credit card category - as you budget to pay down the debt. If you have the money, and are choosing to make use of interest free financing, then make sure the appropriate category has enough money budgeted to it before making the purchase. When you make the purchase, YNAB will move the money to the credit card category. So in this case, the payment available would be $2500 to match the balance on the card. This does not mean you have to pay it this month - it just means the money is there to pay it when you want. You can continue making $200 payments every month until you pay it off if that is what you want to do. chahan Huh. Ok. So instead of budgeting $300 to home improvement and $2200 to short term savings, I'd budget $2500 to home improvement but then only PAY $300 in cash/debit now. Then I'd have a green $2200 on that credit card "available" this month. But I thought the green didn't carry over month to month? So when I pay the credit card $200 next month, would that just "invisibly" draw down cash since it was allocated in a previous month? I'm confused about what the credit card payment category would look like in that instance. Maybe some images will help. I created a test budget for this. Ignore the electric category and checking account balances. You start with $2500 budgeted to home improvement, you make the purchase on the card, YNAB moves the money to credit card category. You don't want to pay $2500, you decide to only pay $300 - that gets taken out of checking and into visa CC (record as transfer with no category required). You still have $2200 available to pay. When you go to March, that $2200 will still be there. You can choose to pay all, or part of it. And repeat. Also note, the location of the actual money does not matter. You can have the money in a savings account collecting interest while you slowly pay down the CC. chahan I didn't realize the green balance would carry over - I thought that "available" number zeroed out when the month rolled over. Melissa All available money that is positive "green" carries forward. In all categories. That is how you build up savings and build up your true expenses for Rule 2. Melissa The only time available amounts don't carry over to the next month is when they are left overspent. If it was cash overspending (category available is red) then it will subtract from your "to be budgeted" in the next month, but the category will go back to zero and gray. If it is credit card overspending (Category available is negative and orange) then the amount clears and it just becomes debt on your credit card account that will need to be paid off over time. Melissa Oh, yes, of course, I'm sorry! I was thinking you meant the spending had already happened in a previous month. Yes, if you purchase it this month and can afford to budget some to pay off this month you can allocate that amount you can afford to pay this month into the home improvement category and then when you make the purchase on the credit card and categorize it as home improvement, the money you budgeted to home improvement will move to the credit card payment available column. Then you can pay off any amount to the credit card you want up to and including the green amount in the payment column. But you don't have to. If you want to make the minimum payment you can. The money will carry forward. If you do indeed have the money to budget for it but you're still going to take advantage of a 0% APR, you can allocate all $2500 to the home improvement category and then when you make the purchase on the credit card and categorize it as home improvement, all $2500 will move to the credit card payment available column. Pay the minimum payment on your credit card or as much as you want up to the green amount in the available column. I did a similar thing a year ago by taking a balance transfer to a 0% APR credit card. I used the move-money tool to move the amount available for payment on credit card A to the amount available for credit card B (which is the one that is carrying the transferred balance). It was originally $5k, and I have been making the minimum payment every month and sitting on the money available to pay it off for a year. Why not earn interest on it instead of sending it to a credit card company? The deal ends sometime next month, so they'll be getting a payment of more than $4k all at once well in advance of that date, because I intend to pay no interest. NB: The money does not get to do annnnything else in my budget during that time. It has a job-- sit there and wait for me to pay off my credit card. Any single day over the last year, I could have paid it in full, because that money was sitting with that job and no other job. That's the key. You don't honestly think anyone's going to read all that, do you? Just get over yourself and let Support have access, which they want because most users (including you, if I'm being honest) are actually pretty crap at explaining their problem. Or just go back to paper and pen if that's what suits you. If you really work in any form of security then you know enough to know that YNAB Support are not hackers who are going to steal your credit card details, and probably they aren't bothered about seeing you in your jim jams either. lindsay_g Thanks so much for your super helpful and empathetic reply. lindsay_g I've read it all. lindsay_g Me too. But also I do have to say you're right about the fact that support could literally not care less about the content that they see. I'm a mail administrator and I could conceivably get access to all my users' mailboxes and rummage through their email, but oh my god, I can tell you I would die of boredom. But you could've been kinder about the way you said it. Melissa I can see that you haven't given up on us helping you, you're refocusing your efforts and trying and being patient, and we're not going to give up on you either! ((hug)) of support. I think I tried transitioning from YNAB4 a good dozen (possibly more, okay....definitely more) times. I finally successfully transitioned in December of 2017. Take a deep breath, get a cuppa of something nice (or an adult beverage), and try again. FWIW: It's the same cuddly YNAB with a few exceptions, but those exceptions are really, really important and different. The credit handling sounds like your biggest hurdle. If you carry balances for floated expenditures (regardless of whether it's 0% interest), and it sounds like you do, then it would be beneficial to take the credit card handling workshop or watch the videos. I dare say the time spent doing that would work out to be a fraction of how much time you've spent in frustration. The conversion of YNAB4 data is also going to be historically wonky if you used the red arrow or pre-YNAB debt. Do not go back and FIX stuff. That's why the transition guide recommends a fresh start. However, doing a mini fresh start in the previous month by zeroing everything out and budgeting your current funds to your current category balances, then ignoring the historical crap, will let you keep your data. Think of it as a one-time sweeping the dirt under the linoleum before gluing it down. I was able to eliminate all of my historical wonkiness by converting my credit cards to chequing accounts in nYNAB. This worked for my data because I had literally no red arrow entries in YNAB4 and because I never floated purchases on any of my credit cards. HappyDance Thank you. I've watched all of the videos, multiple times, and I'm doing the workshop again, because I clearly Just Don't Get It. Honestly, I don't know whether I used the red arrow much, but something's obviously messed up in the import from my old data. Whether it's the original import or something I've done since then, I don't know. I *thought* what I did last month was the mini fresh start you're talking about, but then...something happened when it rolled to February and I'm lost again. HappyDance That looks like a great video - I will watch in a bit. Thank you! It sounds like you just imported your YNAB4 history into nYNAB in Jan. Did you ever "turn the red arrow" to carry negatives in a category from one month to the next? And, when you imported, did you budget in the credit card payment categories the amount you intended to pay (the current balance if a PIF user)? Overspending & debt are handled differently in the new system, & tend to catch up with you when the month turns over. I'm not the best at explaining what happened, but there are multiple threads about those issues with good information. If all your accounts are reconciled, does the Total Available + Budgeted In Future + To Be Budgeted = Sum of Cash Accounts + Positive Credit Accounts? If so, your money is there, you just have to move it around this month until it's where you expect it to be (taking into consideration the credit card payment categories). I don't know if there is a good way to fix the historical data (short of going back & fixing each month, that is), but I hope this is enough to get you on track this month. Yes! It looks like those numbers do add up and the culprit is the "Available" number. So the TBB is a huge negative number because it's starting from that...very, very wrong...number. So I have to figure out where THAT number is coming from. Melissa if you always pay your cards in full, the number in the credit card payment category should be the positive amount of your credit card balance. if you don't pay in full, it should be at least as much as you intend on paying. Money will move into that category when you make a budgeted purchase on the card or if you budget directly to the card or have a return, and it leaves when you make a payment or remove funds. If you have non-budgeted spending on the card, that money won't get transferred & things can get weird if multiple cards or accounts were used during the month with overspending. Paying more than the green amount will make that category red & you will have to move money to cover it. I'm still using YNAB4, but every once in awhile I do a trial with a migration to check things out. I always have a huge red number at the top when I migrate. The reason is due to functional differences between the two that do not translate well in the migration. The solution is easiest right after the migration... just make all your categories match YNAB4 in the current month (excluding the effect of any transactions that were in the YNAB4 account registers but dated in the future) and to fix the credit card payment balances. CC payment balances are a major culprit because of the difference in credit card handling. They relied on the red arrow for the pre-YNAB debt categories, and do not migrate cleanly to nYNAB. All that said, I'm not exactly sure how to fix it once you've moved forward from the migration other than to adjust all your category balances as best you can. Also, check for any hidden categories that may have a balance that used to be zero in YNAB4. Where did that $3.82 come from? Did you have a refund on the card? I had one and is threw the balance out of wack. It looks like those numbers do add up and the culprit is the "Available" number. WordTenor The issue is that the "total available" in the right sidebar is ~$4k, but the amount in my current spend accounts (on budget) is about $800 (I get paid tomorrow, and shifted most of January's "leftover" money into non-budget accounts at the end of the month. Looking at the credit card payments categories "available", they are...all over the place. A couple hundred there, a few thousand there, but there are currently NO CC transactions this month. So those amounts carried over from last month, but...were wrong then, too. So somehow when I thought I had that figured out, I was wrong. I know (or THINK) that the "easy" answer is to go back to some date (e.g., Dec 31) and zero out the available amounts, and then make sure that the January available matches the payments I made in January plus budgeted CC purchases made in Jan that have not yet been paid. (I think that's right?) And if I do that, then theoretically February will right itself and if I figure it out I can keep it right. The problem is that A, I'm not 100% confident I understand HOW to keep it right going forward, and B, I get anxiety about making a "patch fix" when I'm not sure I've understood or solved some underlying issue that might bite me in the behind at some point when I least need it. Melissa When you add the negative TBB, do the left and right hand sides of that equation equal each other? Don’t worry about the credit cards just yet. Step one: accounts reconciled and available checked against the total in the account. Do those two things check out? Melissa Those numbers come from different handling of CC in YNAB4 and YNAB. Do you have CC you pay in full (that is you send at least the statement balance every month)? For those, make sure the CC payment category available = CC account balance (use the move money tool or budget as appropriate for these). Do you have CC you carry debt on? If so, do you know how much you want to send to those CCs this month? Make sure the CC payment category available = the amount you want to send. If you know you want to pay your purchases since the last statement + $X, then it's more complicated as you need to figure out how much you spent on the card since the last statement. The best way to do that is probably to look at your CC account on the bank site. Or use a filtered search on your CC account screen on YNAB to only show the transactions from after your last payment (keep in mind the order of the transactions in YNAB is different from your bank). Once you have this number, move money in/out of these CC payment categories so the available = your purchases since the last statement + $X. In any case, don't worry about what the budgeted column shows. Just the available column. Ceeses I think that's the mental hurdle that I'm struggling with (and I accept that it's entirely a mental one) - the notion that what's in "budgeted" is not what I'm actually...budgeting there. I get that it's because the money is budgeted somewhere else, it's just non-intuitive to me. Melissa I know it's entirely a mental hurdle, but just remember that 10+100+50-10+50 exactly equals 200, so if you're allocating $200 to a category right now that is no different than "correctly" budgeting the other numbers over five months. The number in the available column is going to work out the same. Didn't I say before that I tried bringing in years of historical data and making it all work out in prior months and that I wasted several weeks of my life trying to get it to work out pretty and then I gave up, made category and account adjustments to reflect reality and moved on with my life? Don't do what Donnie Don't does. Also, other people have been recommending that you create a new budget so you can see how everything works together and that you trust it. Nobody's asking you to continue using that budget if you don't want to! Think of it like a sandbox so you can figure it all out without mucking up what you've got even further. It'll still be there waiting for you. I have been poking at my transaction history over the past few hours and think I've figured out where at least part of the issue may be coming from. In YNAB4, I had a (bad) habit of "fixing" previous months by going in and hitting the "budget to zero" button. In the old CC method that didn't really make a difference long-term since whether money was spent from a cash account or on a CC didn't matter. That's fine when you're PIF, but when you're carrying CC debt it doesn't really work and isn't an accurate reflection of a real budget. So, I SUSPECT what happened when I imported to nYNAB is that legacy bad actions took an unintended turn, because there's money back there somewhere that was budgeted to a category that did not actually have real MONEY in it at the time. What would the *functional* difference be if INSTEAD of budgeting to category accounts when a purchase is made on a CC, you ALWAYS budgeted that money to the CC payment account INSTEAD - regardless of when or whether you intended to pay it off. In other words, if I make a $200 home improvement purchase on a CC, I could budget $200 today to the home improvement category and that $200 would move up to that CC's available column. OR I could budget $0 to the home improvement category and INSTEAD budget $200 to that CC's payment account. Setting aside the "knowledge" difference in seeing where you budgeted your money, is there any functional difference in whether you budget it in one location versus the other? Melissa I wonder if it might help, just in the interest of fewer moving parts to figure out, to start fresh with a new budget in nYNAB. I really understand that you want to figure out what happened in the past. I think that may be helpful to your deeper understanding of how nYNAB works. But you mentioned above that you think you might be trying to figure out too many things at once. My hunch is that the quickest road to having a budget that you understand, trust, and works for you would be to start with what you have in your accounts today and what you owe on your credit cards today. Then build a budget based on your current needs and goals. Do what you need to do to figure that out. Then you can circle back and wade through the history if you find that helpful. One of the main selling points of YNAB back when I got it in 2009 was that you use it to look forward, not backward. I think that it's still easiest to use with that mentality. Your imported budget can be saved for reference and history, but fixing things back to 2011 is not the quickest road to having a budget that works for you today. Melissa I think it makes sense to keep the imported budget for history. You can have more than one budget. I just think that 1-2 months of using a new fresh-start budget in nYNAB may give you some more familiarity to go back and look at the legacy budget again. You don't have to scrap it entirely. But don't let it hold up your current ability to budget effectively. Of course, you do what works best for you. There are plenty of people who will help you figure it out. Melissa I think you got to this point in a previous thread too. Where you realized that either the history has to go or your sense of perfection with regard to what is shown in the prior months has to go. I like history, so I would suggest the best option is to let go of the perfection. Your budget is accurate to the amount in your accounts — all that is left is to adjust this month so that it reflects what you plan to pay to your credit cards. Ceeses explained how to do the cards above. Have you done that yet? I'm still working on REALLY understanding credit cards, which is probably the big hurdle. I've created a "fresh start" budget that I'm playing with to get the theory and mechanics settled in my brain, and trying to (sort of) ignore the "real" budget in the meantime. This time I actually feel like I'm making steady progress, which is improvement over last time.